Home » Stories and Recipes » Cabbage » Sounds good on paper. It all begins with a perfect summer day, warm and lightly breezy. The sun is low in the sky, reflecting off your sunglasses as you pull up to the bar for a cheap, watery beer that could not taste better passing over lips still salty from the ocean. The bartender promises great fish tacos and they sound like the perfect filler for a growling stomach, hungry from an afternoon of bodysurfing. They come out, and with a squeeze of fresh lime you take your first bite. Eh…the cabbage is dry and flavorless, the lime is too bright and the fish is greasy. On a good day it’s rubbery, on a bad day it’s mush. The mayonnaise mixed with hot sauce and large stems of cilantro do little to add either depth or subtlety. Fortunately, the bar has more beer, enough to drown your dismay. With the first warm days of spring coming hope renews. This year, fulfill every expectation of spring love. Flavorful cabbage, softened but still crisp, lightly fried fish, flakey and light, bright, citrusy tomatillo salsa and tart, rich avocado crema. This, my friends, is the perfect fresh bite on a warm afternoon. Grab your sunglasses and ice down the beer. I’ll grab some tortillas and be right over. This looks like a lot of steps and ingredients. Let me break it down: you’re marinating fish for 30 minutes. Meanwhile, you throw together a quick salad dressing for the cabbage and mix avocado and lime zest together with Mexican sour cream. If you are making the tomatillo salsa from scratch (trick question, the answer is always “yes”) then you throw those 5 ingredients in a food processor for 30 seconds. Et voilà (that’s Spanish for…oh, never mind) you are ready to fry the fish and eat the best fish tacos you’ve ever tasted! Make the marinade for the fish: Whisk together lime juice, 1/4 cup cilantro, cumin and jalapeño. Whisk in oil and season to taste with salt and pepper. Coat tilapia with marinade, and refrigerate for 30 minutes. Make the vinaigrette for the cabbage. Chop garlic and sprinkle with a pinch of coarse sea salt. Mash into a paste with the flat side of your knife or tines of a fork. Whisk together garlic paste, coriander, cumin, Sherry or Serrano Honey vinegar and mustard with a pinch of salt and pepper. Whisk in oil to form a thick emulsion and dress cabbage heavily. Refrigerate for 20 minutes. 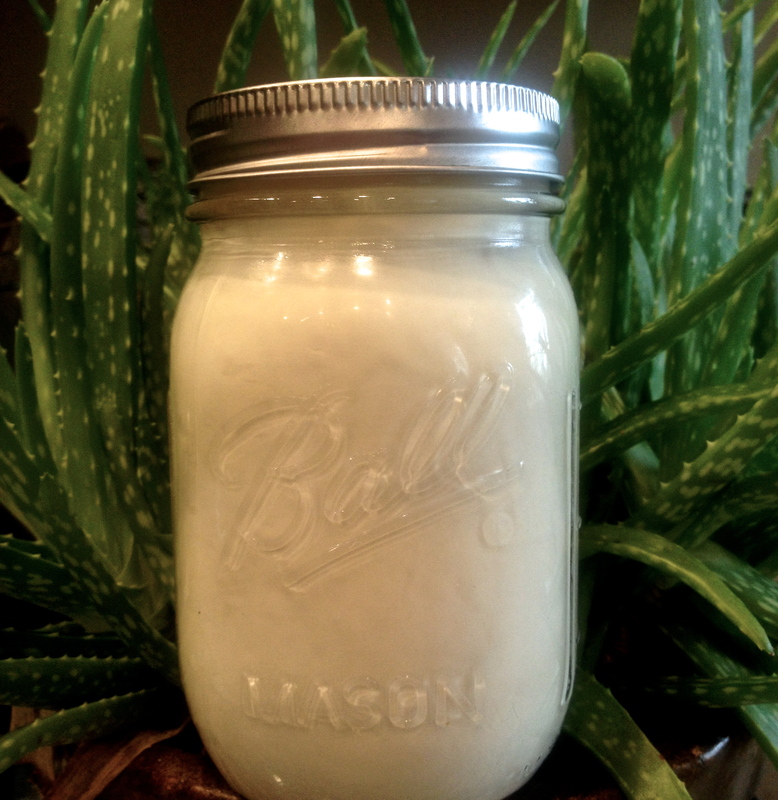 Make the avocado, lime crema: Mash avocado with a pinch of salt. Stir in crema and lime zest. Season to taste with additional salt and pepper. Prepare fish for frying: Whisk egg in a medium bowl. In another medium bowl, whisk together flour and cayenne, with a pinch of salt and pepper. Warm tortillas in a 250 degree oven. Remove fish from marinade, brush off herbs and cut into 1” pieces. Dip fish in egg, then flour. Shake off extra flour and place on a platter. Heat 2 tbs olive oil in a 12” skillet over medium heat. Fry in a single layer, without crowding, turning once. About 5 minutes total per batch. You can cut a piece in half to see if it’s ready. The thin side of the filet will cook faster than the thicker chunks. Remove these from the heat first. Set fried fish on paper towels to drain. 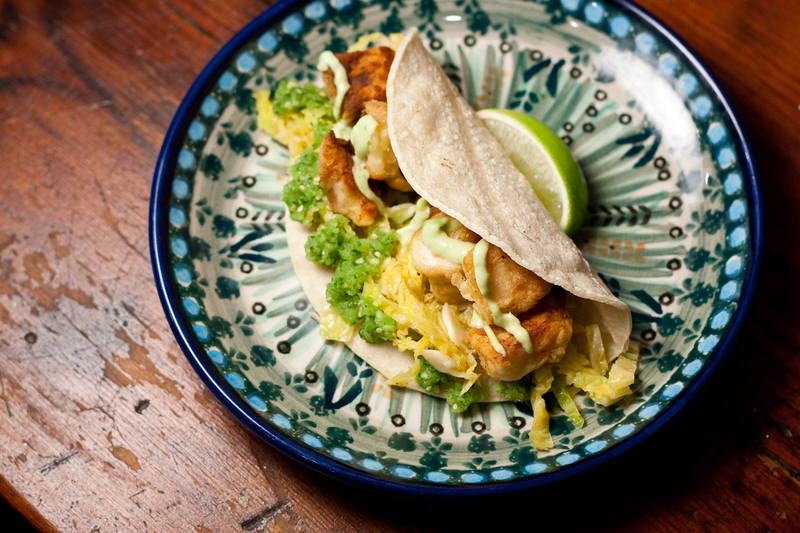 Layer each tortilla with cabbage, tomatillo salsa, avocado crema and top with fish. Love your life. This looks delicious! I’m from California, but have never tried making my own fish tacos before.. maybe I’ll have to give it a shot! That is such a gorgeous meal! I agree – fish tacos that are rubbery and not fresh are not even worth it. The tangy-ness of the cabbage sounds perfect with the fried fish. Will have to try this soon!